These pages give an overview of our current research. The work in the group is centered around nanophotonics. This includes a variety of topics, ranging from optical effects induced by dipole-dipole interactions occurring over atomic length scales to near-field optical interactions taking place over distances of several tens of nanometers. Active projects include manipulation of surface plasmon dispersion in nanoscale thin film systems, the enhancement of erbium excitation in semiconductor nanocrystal doped oxides, the enhancement of optical nonlinearities using plasmon resonances, and more. 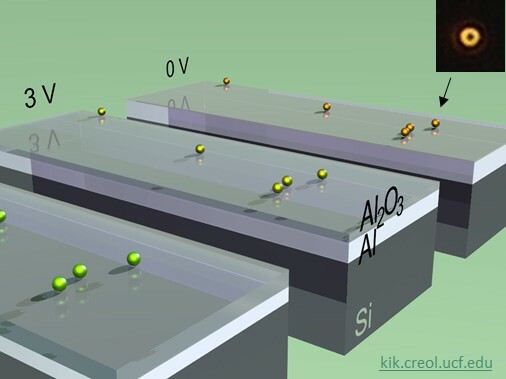 Additional information on our work can be found in the research section, in this brief introduction to our group, and in this article on plasmonics at CREOL. Presentations about our work can be viewed online in the talks section. To learn about the instrumentation needed for nanophotonics, have a look at the equipment in our laboratory, and at the CREOL cleanroom. 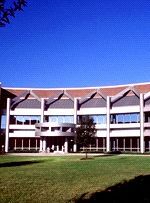 For more examples of nanoscience at UCF, see the links section. New: Have a look at our new mapping spectroscopic ellipsometer. Rendering of gold nanoparticle plasmon resonance control through anodization of an Al substrate, part of a study soon to be published in ACS Nano. Single particle spectroscopy was carried out on individual Au nanoparticles after several anodization steps, showing strong z-polarized light scattering and a consistent blue-shift as the applied voltage increased from to 12V. For more information see our recent publications section.